Kids and dogs were practically made for each other. They often share many moments of playful fun. However, children are often the number one victims of the dog bite cases we see. More often than not, with a little knowledge and understanding, dog bites can be prevented. 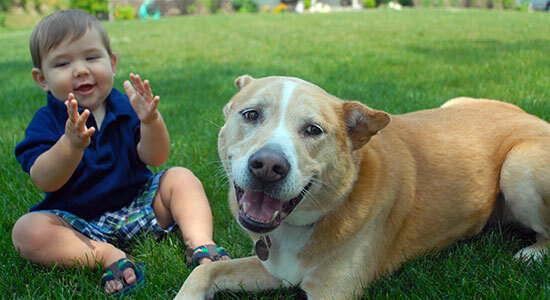 We've collected a few tips to teach your kids about keeping safe when meeting new dogs or spending time around them. However, if a dog injured your child, call our professionals for a free legal consultation. We're available 24/7 at 1-866-943-3427, or you can complete the form located in the top right corner of this page. There's no fee and no obligation to use our services. Don't wait. Call us today. Many kids are tempted to excitedly run up to a dog, hug him or kiss him, try to pat his head, or use many of the actions that humans use to show affection. Unfortunately, dogs don't understand these behaviors the same way as humans. In fact, some dogs may feel threatened when approached this way, causing them to panic and attack. Always greet a dog by calmly walking up to him. Make sure to ask the owner if you are allowed to pet the dog. If the owner says, "yes," then curl your hand into a light fist and slowly offer the back of your hand for the dog to sniff. Don't try to hug or kiss the dog. Instead, pet him gently under his chin or on his chest. Being responsible around dogs is the first step toward preventing a dog bite. Understanding a dog's body language can help your child understand if a dog is aggressive or not. Be sure to check out our page on the signs for an aggressive dog. Don't steal a toy or run up to and away from a dog. If the dog is not familiar with you, it may not know you're playing. If you see a "service dog," it's important not to distract him. He's doing an important job for his handler and shouldn't be touched. Be sure to give the dog space, especially if he's sleeping or eating. Wait for him to come to you. Always be careful around a mother dog and her puppies. Sick or old dogs may be in a bad mood and bite. Be sure to consult our great infographic of Doggie Do's and Don'ts: Just for Kids. It is a great resource for educating kids on how to interact with dogs. If you or your child has suffered from a dog's bite, contact our legal professionals for a free case review. Call us at 1-866-943-3427 or fill out our free online legal consultation in the top right corner of this page. There's no fee and no obligation to use our services. Our professionals will answer your legal questions and fight to get you the compensation you deserve. Remember, there's never a fee unless we get money for you. If we don't win your case, then you won't pay us anything. That's our guarantee. Don't hesitate. Let us get to work for you today.